Solaren hopes to raise more than $100 million to develop an orbiting solar farm in space. The project would require billions of dollars, including rockets that are likely to cost $150 million each. Gary Spirnak is used to playing with big ideas and machines. While at Boeing Satellite Systems, he was responsible for finding new markets for satellite technology. At Hughes & Space Communications, before Boeing bought it, he was part of a management team for projects on spacecraft and their ground stations. Now Spirnak is leading a small team at a company he co-founded to tackle an unprecedented mission: building a space solar power plant that will convert electricity into radio waves that can be beamed down to Earth, where the radiation will be converted back to electricity for feeding the grid. "Space solar power was in the realm of the government and academic world before," said Spirnak, Solaren's CEO who also and a former spacecraft project engineer for the U.S. Air Force. "This is a business for us. It's about making a good return for our investors." The space solar company seemed to have popped out of nowhere when it announced a deal to sell electricity from the space solar farm to Pacific Gas and Electric in April this year. It also made PG&E the only utility in the United States, if not the world, to agree to a space solar power contract. But Spirnak started the company in 2001 to work on the power plant designs and file for patents, though he and others didn't start quitting their day jobs until Solaren won its U.S. patent and pooled together "$3 to $5 million" from founders and investors in 2005. The company has about half a dozen full-time employees and nearly 10 other part-timers. Solaren is looking for engineers and scientists to start the research and development work next year, Spirnak said. Winning that power contract with PG&E was a crucial step for Solaren, which would have had a more difficult time raising money without it. The 15-year agreement calls for Solaren to start delivering 1,700 gigawatt hours of electricity in mid-June 2016. The California Public Utilities Commission approved the power purchase deal unanimously Thursday. The terms of the sale are confidential. Reading a prepared remark, CPUC president Michael Peevey quoted poet Robert Browning ("A man's reach should always exceed his grasp, or what's a heaven for?") and added, "While reality may not live quite to our idealized aspiration, it's our pursuit of a perfect world that gives rise to a better one." The approval didn't come without conditions. The commission said PG&E cannot count this contract for complying with a state mandate to offer an increasing amount of electricity to its customers until Solaren meets certain milestones. The idea of launching a solar farm in space sounds farfetched, though it has attracted research dollars in countries such as the U.S. and Japan in recent decades. NASA used to receive funding in the past to identify and explore technologies that might make such a power plant feasible. But the agency has no such funding now, said Katherine Martin, a spokeswoman for NASA. Japan's own space agency began its own space solar research in 1998, and recently announced its goal to build a 10-megawatt pilot project by 2020 and a full-scale power plant by 2030. Solar power from space is an appealing concept. Depending on where it's located in orbit, it could avoid the Earth's shadow and essentially collect sunlight and generate electricity around the clock. In comparison, a terrestrial solar plant can only churn out energy when the sun is out, and clouds and bad weather could significantly curb its power production. But turning this concept into reality will require complex engineering and operations. Solaren also will have to work on minimizing losses during the conversion and transmission of the energy, as well as securing permits and convincing public of the project's safety. "They will have to do a lot of work that is groundbreaking," said Les Johnson, a NASA physicist who talks about space solar power in his upcoming book, "Paradise Regained: The Regreening of Earth." The book looks at potential solutions for combating global warming. Johnson, who is not speaking on behalf of NASA for this story, said one of the biggest hurdles is to make the solar power plant lightweight to minimize the number of rockets that would be needed to launch it. Solaren has come up with ideas to tackle this challenge, Spirnak said. In fact, the core of the company's patent deals with the design of a lightweight system. Part of that involves the use of high-efficient solar cells and might even use mirrors to concentrate the sunlight onto solar cells to boost power generation, he said. With concentration, the most efficient solar cells can convert nearly 40 percent of the sunlight that fall on them into electricity these days. Spectrolab, owned by Boeing, recently touted its ability to fabricate cells to reach 41.6 percent efficiency, though it hadn't been mass-producing this type of cells at the time of its announcement. Solaren is hoping that solar cell developers could bump the efficiencies close to 50 percent by 2014, when it would place its order. The company envisions using four or five rockets, at the cost of $150 million each, to send equipment into space, Spirnak said. The solar power system wouldn't be one giant piece of equipment. That would require complex assembly by robots or even humans and add hefty costs to the project. Instead, the system is likely to be divided into two or four parts, and they would fly in formation, he said. Each piece could be folded like an umbrella or an accordion, and unfurl when it gets into space. Solaren hasn't settled on a particular design yet, and would work with its contractors to figure out the best way, Spirnak said. The rockets would launch the system into geostationary orbit, which is about 22,300 miles above Earth and high enough to avoid the Earth's shadow for over 99 percent of the time. The system would move at the speed of the Earth's own rotation, so that it would appear to be stationary from observers on Earth. Aside from the solar farm in space, Solaren plans to build a station near Fresno, Calif., to receive the radio waves and convert them into electricity. It also would operate a satellite control center in Los Angeles to monitor the solar farm. The entire project is likely to cost a few billion dollars, Spirnak said. 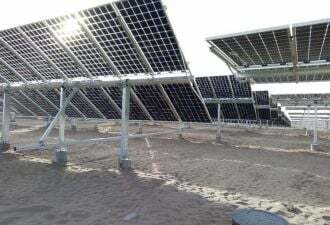 Solaren expects its power plant to convert about 50 percent of the sunlight into electricity, and about 80 percent of that into radio waves. Its receiver station should be able to convert 85 percent to 90 percent of the radio waves back to electricity. But radio waves can scatter, and the water and aerosol in the atmosphere would absorb some of the radio waves before they hit the ground. So the efficiency from sunlight to electricity on the ground would likely to be 25 percent, Spirnak said. That means Solaren would need to build a power plant with 800 megawatts in generation capacity in order to deliver the promised amount of electricity to PG&E. Johnson said the amount of energy losses would vary depending on what kind of radio wave Solaren ends up using. Microwave, for example, is a well-understood and practiced technology because that's how radar, cell phone towers and microwave oven work. But converting microwave back to electricity could prove trickier. "There hasn't been a need to convert microwave into electricity, so there hasn't been a lot of research into that," Johnson said. Engineers at Solaren will be busy with working on various energy conversion and transmission technologies in a lab. It plans to demonstrate its designs outside of the lab and then in space in 2011 and 2012, before construction begins. "It'll involve detailed, meticulous approach," Spirnak said. "We have a lot of experience with satellites, and we are confident that we will meet our dates."